As of the time of this blog review, Dirk Gently's Holistic Detective Agency has been cancelled by BBC America. As the show was also distributed on Netflix there are petitions for the company to take over production and try to continue the show but in recent years such efforts have rarely succeeded. But such is the way of things for quirky genre shows like this. And it's easy for me to feel like this seems to happen more for the sort of oddball shows that Tobie and I rather enjoy for one reason or another. I'm sure we're not alone in thinking this as shows like this circulate in some quirky geeky circles. But I honestly liked this show and felt that the disparity between the first and second seasons really demonstrated the strong push of the creative team behind it to do something crazily different. The way elements from season 1 were still present but with more or completely different meaning is part of the brilliance of the show. It's a major shame that it won't continue any longer. Synopsis: Dirk Gently's Holistic Detective Agency is a quirky science fiction detective series created and written by Max Landis. The show was based on the books of the same name as written by Douglas Adams. The show was distributed by BBC America and Netflix. So Dirk Gently (Samuel Barnett) is in the hands of Project Blackwing together with other individuals with special abilities including three members of the Rowdy 3 (who were actually four guys). Todd (Elijah Wood) and Farah (Jade Eshete) have been on the run from the FBI while they've been trying to figure out where Dirk is. Meanwhile Todd's sister Amanda (Hannah Marks) has been traveling with Vogel (Osric Chau), the fourth member of the Rowdy 3, trying to find Todd and Farah in turn. The other part of the season relates to a strange magical realm known as Wendimoor with its own odd civil a war of sorts fought by knights that use giant scissors and other expected sharp objects. Their realm has been under threat from the Mage (John Hannah) and their main hope is related to a prophecy that names Dirk Gently as the man while will bring "the Boy" back to save the kingdom. How the fantasy world relates to the very real complications that the team is still facing is what drives the season. What I Liked: It's sort of bonkers how almost evety character from the first reason was still super important in this second season but for completely different reasons this time around. A quick review of the first episde of season 1 will help you appreciate how season 2 has shuffled everyone around in novel new ways. And how it all comes together is of course what makes the show continually fulffilling as long as you ride this crazy train all the way to the end. The shift in roles also helped us see new sides of everyone and appreciate their abilty to take their characters in new directions. Who would have thought that the Rowdy 3 would be viewed more as heroes given how they were initially depicted in the first season? And then you have to take a moment to celebrate the new characters whether they just joined the show or were supposedly there the whole time. Mind-boggling, I tell you. What Could Have Been Better: The shift from season 1 to season 2 is pretty rough, especially if you appreciate narratives that have a more logical flow from point A to point B. And it's not quite like that the first season made complete sense on its own so I guess one can't complain too much. The parade of familiar faces now doing different things rather adds to the complexities of things and the challenge of figuring out where the story is going. With the premature end to the show, things do end on a very odd note that naturally does not feel all that satisfying. The character that really got the short end of the stick here, at least in my opinion, was Bart (Fiona Dourif) the holistic assassin, as her role in the show felt rather diminished versus the first season and quite a missed opportunity given how awesome the character concept is overall. 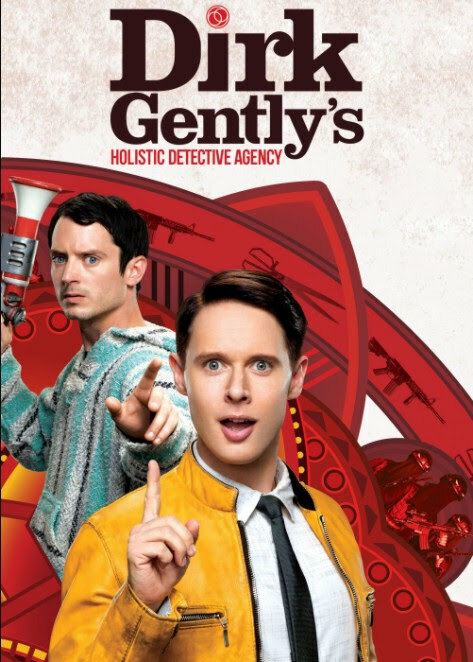 TL;DR: Dirk Gently's Holistic Detective Agency's second season is a sublime and crazy elevation of things in a completely new direction but eventually gets back in line wit the core crazy brand of the show. It's not a perfect end to the series as a whole but it's still a great romp for these characters. Thus the season gets 4.5 strange power sets the other subjects of Project Blackwing possess out of a possible 5.